Running waist belts are not a new idea or technology, but they have certainly gotten more streamlined and usable over the past year or so. 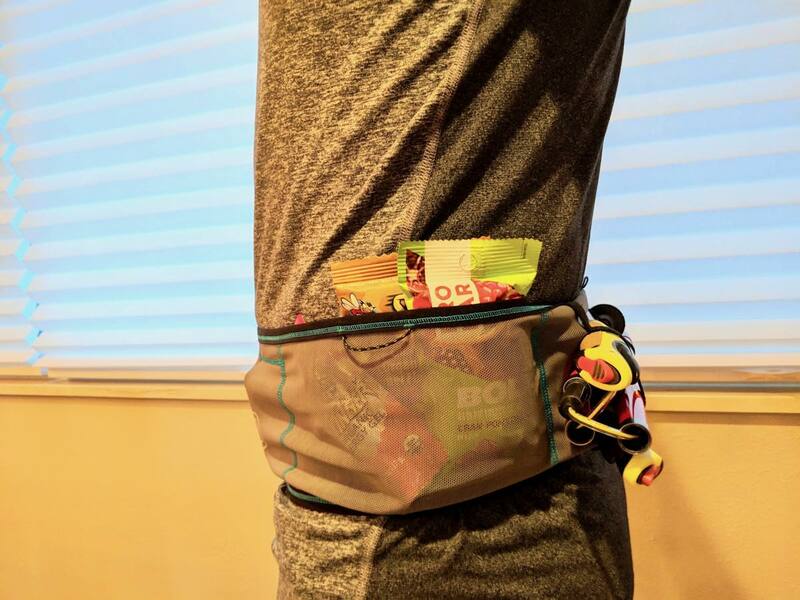 While ‘fanny packs’–or ‘bum bags’ as they are known in fell running–have long been a part of some runners’ kits, several companies have most recently adapted the idea into the functional and minimal ‘waist belt.’ These belts have really expanded on the possibilities of waist belts in functional carrying capacity and lightweight comfort, and they have become a very functional way to carry a bit of extra gear for medium-long runs and foul-weather outings. The first thing I noticed about the Ultimate Direction Utility Belt is how lightweight (2.25 ounces) and wide it is. A size medium (28.7 to 31.8 inches) felt barely there, and once I started loading the belt it felt even more secure. The width of the belt really seemed to spread the weight of what I was carrying well and kept the belt from bunching up around my midsection. The combination of a very soft nylon/spandex mix and flat seams means that I didn’t experience any skin irritation while wearing this belt underneath my shirt and directly on my skin. The durable stretch mesh has a simple, four-pocket pocket design with the outer lip of the belt significantly higher than the lower lip. This helps things like phones, keys, and gels stay secure, but it also makes sliding things in and out while running much easier. There are multiple pockets which can accommodate a 500-milliliter soft flask and it isn’t difficult to get the flask in or out on the run. Previously, I’d enjoyed carrying a flask in the Nathan VaporKrar WaistPak, but found it difficult at times to get a flask back into the belt after drinking. With the Utility Belt I can stuff a flask into the front or back pocket without issue. The back of the Ultimate Direction Utility Belt. The Utility Belt is also the first system and only belt I’ve tried that securely carries poles without any bouncing. Nothing can make you feel more like an over-geared fool than your poles flailing out of their straps. With my poles secure in the Utility Belt, I hardly noticed them while running. I tested the security of these loops while running at faster paces and down hills to see if they would bounce out, and no matter which brand of poles I used, they stayed in place. 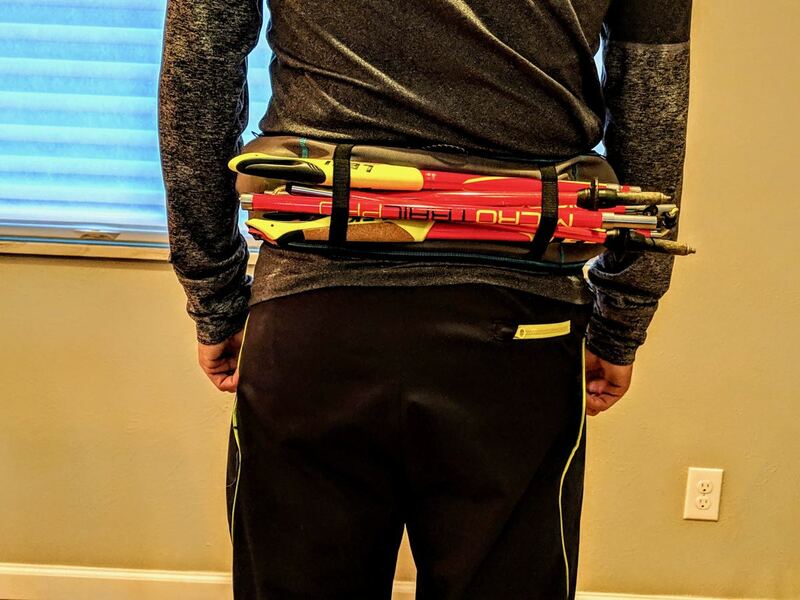 I like being able to twist the belt around my body on the run to secure the poles and then store the poles on my back so they are out of the way. Ultimate Direction seemed to nail the design on these belt loops by keeping them closer together and making them elasticized just enough to not require a great struggle to get them in and out. After about four months of use, the loops aren’t wearing out or fraying. A side pocket on the Ultimate Direction Utility Belt. I do really like the concept of the waist belts as they allow us to free our backs from the burden of a pack. You have better ventilation with a belt on, and I feel like my center of gravity is better without a pack. It’s a great combination with a handheld bottle, and this is a set-up that will work well for most runners aside from their longest runs and races. Out of the three belts I tested, the Ultimate Direction Utility Belt is the only one I can recommend. Its simplicity in design and function has made it a go-to piece of gear for me this fall and winter. Being able to throw my phone, some food, and my keys in this barely there belt keeps me from caring what shorts or pants I’m running in and whether or not they have pockets. I’m not showing any wear or tear on the belt and it seems incredibly well made and equally comfortable over or under my shirt directly on my waist. 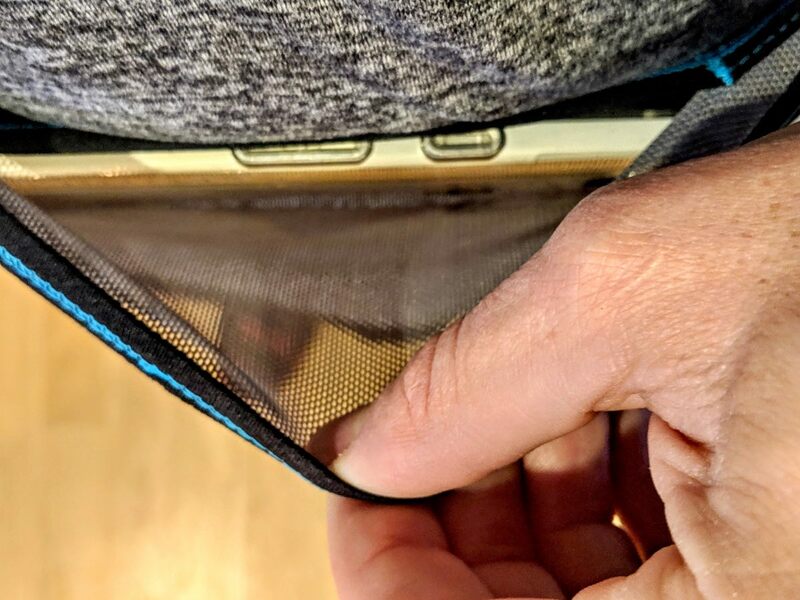 My only small request would be to put a thin, waterproof membrane on the inside of one pocket against the skin to protect electronics like a phone from sweat and grime. I typically have quite a bit of condensation on my phone and inside the case after a run, and it would be nice if this were remedied. The Utility Belt is a great piece of gear, and if I misplaced it I would certainly buy another. An Ultimate Direction Utility Belt pocket close-up. 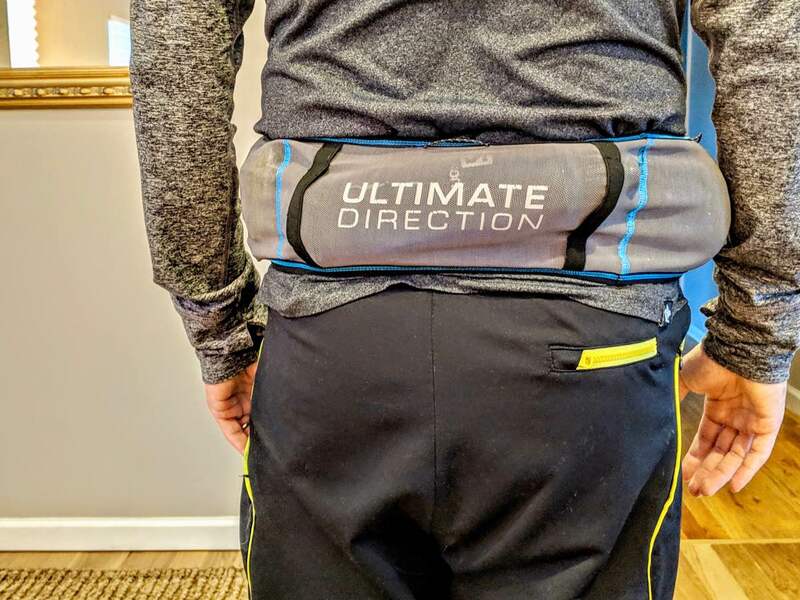 Have you run in the Ultimate Direction Utility Belt? If so, what are your thoughts on its overall fit and feel? What do you think of the pockets and what you are able to comfortably carry in them? Do you store poles on your Utility Belt? How does this feature perform for you? Poles stowed on the Ultimate Direction Utility Belt’s elastic straps. Tom Caughlan is iRunFar's Minimalist Gear Editor. Tom’s passion for trail running and specialty running retail experience shine through in all of his highly technical reviews, which do range outside minimalist shoes. Started using one of these a couple of months ago and it’s quite simply the best bit of running kit I own. I’m from the UK and had a family member bring one back for me from the US. Fit and comfort is great, barely feel i’m wearing it even when full. I haven’t used it with poles yet but often thread a waterproof jacket through the back loops which fits my needs well. Easy to get out and stow again when it’s not needed. Very useful in changeable weather. I agree would be nice to have a waterproof lining in one of the pockets but without it being seal-able, I’m not sure it would stand up to much rain (In the UK, that’s important!). I’d personally rather keep the full, easy accessibility of all the open pockets. I usually just stick my phone in a plastic sandwich bag anyway to make sure rain or condensation doesn’t get in. My one request from UD…make it more available in Europe. Regarding availability in Europe, it’s currently out of stock until mid-February in the US, so it might be more or less globally unavailable temporarily. You mentioned trying some others in the article. I would love to know what you are comparing this to and maybe pros and cons of each. I know that wasn’t really the point of your article, but I’ve seen comparison articles on here before and usually find them more useful than just “hey, use this because I think it’s the best” type articles. Absolutely agree. 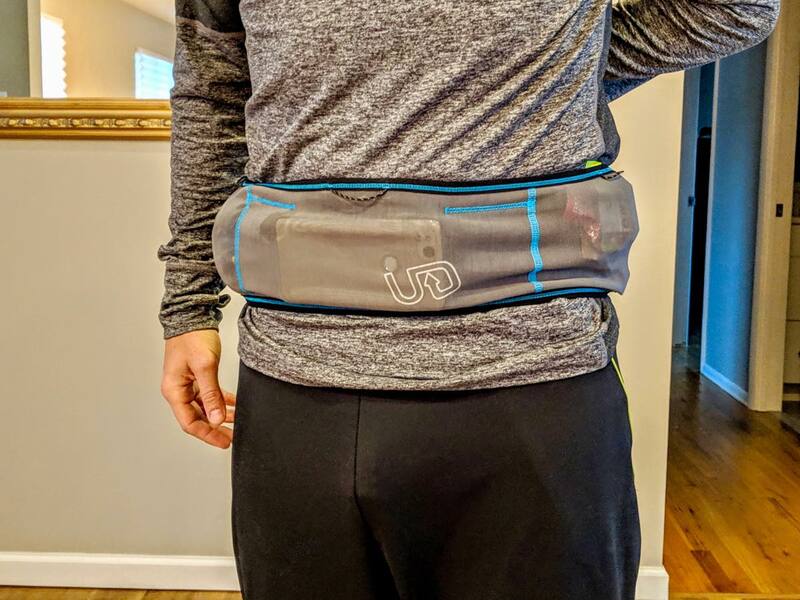 I originally wrote the article as a comparison, but the UD Utility belt really outshined the other two belts which were the Naked Running Band and the Ultraspire Fitted Race Belt. I didn’t find the Naked band nearly as comfortable (the fit was right, but the belt is generally more rigid) and the pole bands were very hard to use. I also don’t personally see the need for the Euro-style number holders, and when I put a 500ml flask in the pockets the pressure on the nozzle caused them to leak. This happened with UD flasks and Salomon flasks. With the Ultraspire I found the pole loops absolutely useless. Poles flopped around against my back until the they fell out. This is a similar design the the Ultraspire Momentum pack and these loops just don’t work. Hi Tom, does this belt ride up or slide down on itself, narrowing the height of the band? I have this issue with the Ultraspire belt even with some stuff in it. Maybe it’s just my body shape or posture, but I wish it would stay stretched wide, top to bottom, if that makes sense. This is also my favorite waist belt. It carries the ultimate direction body bottle 500ml well. I’d also like to see one sweat barrier pocket as well as a zippered pocket. Another improvement would be the ability to quickly stuff the bottle into a pocket that doesn’t press so hard against your skin. Putting the bottle back in the belt can take a little messing around to be sure it’s completely inside. Good job UD on a simple, lightweight belt that works and doesn’t alter your stride! With how UD loves to put zippers everywhere on their packs it’s funny seeing them avoid them completely on the belt. What other brands have you tried? Have you compared this UD belt to the Nake Running Band? I really like my NRB, but I find their sizing to be very limited and super specific; which doesn’t help if you happen to “move around” in waist size throughout the year (I typically put on a few pounds during winter months). I love the utility and usage of a belt, but find that I don’t use my NRB much right now because I’m not as skinny as I was when I bought it 18 months ago. One thing I didn’t like about the NRB was that when I put a 500ml flask in the back, it seemed to bounce around quite a bit, even though it is marketed as “secure and bounce free”. Have you run very long distances with a larger water flask in the UD belt? The mention of the phone is there. Does your phone deal with sweat alright? For me, I have to keep the phone in a ziplock bag to prevent moisture getting to it, even though it is supposed to have some water resistance. Is that what most others do, or maybe I just sweat so much more that I need to worry about it? My phone (Google Pixel 2) does well so far with getting sweaty. Although, I do have to take the case off and wipe off moisture after runs. I’m a sweathog so I appreciate waterproof pockets on gear. Definitely alleviates some anxiety about trashing your phone. I’ve got a Pixel 3, but I guess I’m still not that trusting with it’s sweat tolerance! But good to know that you also find it seems to work. Thanks! Have you tried using it in addition to a regular vest? I’m curious whether that would comfortably. Thinking the extra storage would make the combination roomy enough for something like fastpacking. I used a Naked Belt in combination with a Zpacks fastpacking style pack to good effect at the White Mountains 100 last year. The combo was nice for extra storage and, in the cold, the belt was nice for pre-warming food. Curious about how it compares to the Naked Running as well. I did test the Naked belt, and while it performed well from pocket/ storage perspective, I found the fit a bit more constricting and not as stretchy. I also found the pole straps to be too far apart and when the poles were inserted this extra stretching constricted the belt even more. It was very difficult to get the poles in and out on the run. The UD Utility belt pole straps are closer together and they have a bit more stretch to them. I used the NRB alone for a 50k and along with a vest for a 100 this past summer. At first it did not bounce much but it has stretched and now rides up and bounces a lot if I have more than some small items. I found it to be very handy for stashing the poles at aid stations and on mellow downhills and flat terrain. However, I did suffer from pressure on my hip flexors during the 100. Anyone else get this from waist packs? I just ordered a quiver for poles and hope that will be the solution to stashing them. I’d be curious if the UD band will hold up from stretching out like the NRB did. I have worn this belt for almost every run for the last four months, and so far, its holding up well. I worried about stretching as well, and the UD belt is overall stretchier than the NRB which put more pressure on my mid-section, especially when carrying poles. I wonder how it compares to the Ultimate Direction Race Belt. Does somebody have experience with both models? Tom – to your comment on the VaporKrar WaistPak and getting soft flasks back in. I found I had more trouble if I was using the Nathan flasks, and when I switched to UD Body Bottles (which I have from my AK 3.0 vest and Amp handheld) there was little to no issue with getting them back in. I also switched to the UD bottles due to not liking the rigid spine of the Nathan bottle against my back. It definitely works better, but not as easy and fast as the UD Utility Belt. I still like the Krar belt a lot though. Is this a one size fits all or does it adjust? Looks like just a loop which I’m wondering even if they have say 3 sizes wouldn’t that mean, especially with a sport like running that you basically have only three sized people this will work for? Matthew and Mathias: The Utility (and Comfort) Belts are 100% stretch fabric, and simply slip-on w/o adjustment in order to achieve maximum weight-savings and comfort, and therefore come in 5 sizes for a wide range of fit. The belts using the traditional design of an adjustable clasp (buckle or velcro, like the Race Belt) are adjustable so come in 1-2 sizes. These are two entirely different concepts, with the slip-on style much more recent. – Buzz (UD VP). Thanks Buzz. I own the Race Belt an like it a lot. The only thing that bothers me a bit is having to choose between phoine and flask to carry with me. The utility belt seems to offer a new perspective because of the multiple pockets. I own the NRB and have used it for about a year, including a really tough (I.e. long duration) 50 miler. It seems to work pretty well for me, except I did have gut problems At the half way point of my 50 miler which makes me wonder if the constant tight pressure on my abdomen (I wear the belt below my hips) is maybe what caused my stomach to go south. Unfortunately, since that race and training cycle, I have put on a few pounds so I cannot use the NRB comfortably any longer. I think that their design is far too restrictive in size ranges. I would love to find one of these UD belts at my local run store so I can try it out and see how it fits as well as rides. I’ve been using Naked Bands pretty much from their start and now the Vest. I’ve also used UD Signature Series pack as well. I have not tried this UD pack, but it does look good. Also, I’d think not having zippers is a plus as I’ve found UD zippers to be stubborn over the years. NRB is designed to be tight. I train with the NRB so much that I don’t even notice it’s on, and I’ve never noticed it causing me stomach issues. For some folks, they might find it a niche piece of gear, but for me, I really like it. Running with minimal items does offer a lot of freedom, especially for 20 or fewer miles. Thanks for the review. Maybe I’ll try that make/model for my second. The only thing I’d take exception to in the review is “this is a set-up that will work well for most runners aside from their longest runs and races.” What in the name of sweet Pete are you carrying on long races? I used the NRB quite successfully last summer in both San Diego 100 and Teanaway 100 (the latter of which is a VERY stout new mountain 100; made SD100 seem like child’s play). The NRB carried 40 oz of water (two solomon flasks), 1.5 hrs of food, buff, gloves, ghost whisperer jacket, headlamp, spare headlamp, and poles without a problem. Sure, I had a vest in a drop bag just in case the weather turned freaky bad and I needed to carry more clothes, but for any race with less than 2.5 hours between aid stations that is not named Hardrock, what else do you need to carry??? And I believe I just watched a video where some Hardrock runner was using a NRB as their only pack. As an aside, I don’t use the pole loops. I just tuck the poles diagonally in through the front and have the band snug it up against my hip/stomach. I know that sounds crazy, but I went for hours at Teanaway that way and really didn’t think it was an issue. Super fast stow and deploy with no fuss. Are you wearing the UD utility belt on your waist or hips? Which size did you go for? I have been using flipbelt for years but i would like top openings rather than in the middle. Also the flipbelt is not quick drying, is the UD quick dry material? Did you compare this one to the salomon pulse belt? As far as quick drying goes, these are definitely that. In fact, they’re so light and thin it’s hard to even conceptualize of them as getting “wet.” Yeah, they do, but it more like damp. Barely. I wear the Utility Belt sized for my hips. I was between sizes and wish I’d chosen the smaller size so that it would be a bit more secure when it inevitably rides up closer to my waist. On the other hand, it doesn’t constrict my hips or give me any abdominal discomfort. It rides up less when it’s full, but the shifting isn’t terribly bothersome when it’s empty. I have to wear it over my shirt, though – looks pretty dorky but works well and doesn’t chafe. I tried using this belt last weekend during a 50K and it failed my. I loaded 3 packets of tailwind into the left pocket, 4 spring energy gels into the right pocket and an IPhone X in the back and I had way to much bouncing. Also, it kept sliding down and I had to continually pull it up. Luckily, it was a multiple loop race so I was able to ditch it and use one of my old UD belts. Was it just the pole holders you had issue with on the ultraspire? This UD belt is hard to get in EU but the ultraspire isnt, its also a lot cheaper. Not that it really matter if the quality is worse. What were your judgement on the packing and pockets of the ultraspire? is it has wide as the UD so that you can stock bars “standing up” rather than having them “laying” in the pockets?